When we are going to perform HDD repair or data recovery, we need to dignose the hard drives first and find out the failure reasons. For data recovery companies or hdd repair or laptop repair companies, they usually use some professional hdd repair tools such as HD Doctor suite or PC3k. Seagate HDD repair is a little special compared with other HDD brands, many operations are completed in the CMD mode and you must understand the use of some special hdd commands. Diagnostics of Seagate drives is performed on the basis of the messages, which they output to terminal when a malfunction manifests itself. If a drive fails to report on readiness, you should registered the terminal messages output at drive power-on. Please keep in mind that at drive power-on its terminal functions at the exchange rate of 9600. Further we shall describe typical HDD malfunctions arranged in a common list first and then individually for each family. The problem can cause a lot of related troubles and it can manifest itself in different manner. Therefore, when a drive arrives for diagnostics, a check of contacts and their restoration, if necessary, must be one of the first steps. A common rubber piece can be used for that purpose. Such situations should be avoided through probing of drive power supply lines before its power-on. If a short circuit has occurred, it might have been caused by burnt-out protective diodes. Power circuits in Seagate drives include components intended for PCB protection against damage resulting from overvoltage. They may be found in both 5 V and 12 V supply lines. Their original marking is TRANSIL, Transient Voltage Suppressors. Elementary diagrams of some PCBs with indication of positions of those components can be found further in the sections describing individual drive family peculiarities. 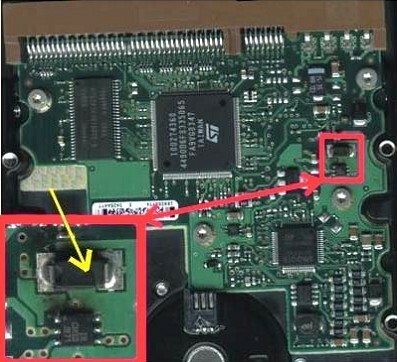 If one of those components burns out, sometimes it should be enough to unsolder it to restore drive operation. However, it’s recommended to replace the diode with an operational one to improve fail-safety of the drive in question.